I wanted to share with you another article from our friend Jim from the discussion board. Breaking down Hebrews 10:24-25, he gives some good advice on how we ought to treat one another as we see the Day approaching and why pastors and ministry leaders should recognize the lateness of the hour. Hebrews 10:24-25: A few considerations. As August comes to a close, those watching the prophetic clock tick by will note that less than a month remains before September 23, 2017—the day that many people believe is the literal fulfillment of the prophecy of a “great sign in heaven” recorded in Revelation 12:1-2. Some watch for this date in eager anticipation, hoping that the Lord Jesus Christ will return and rapture away His church on or near this date, while others watch in jaw-dropping disbelief, wondering how anyone could believe that the date of ANY prophetic event could be accurately foretold during the Church Age. Let me back up a little. Growing up in the United States, like many others, I was bewildered by the dozens, even hundreds, of different kinds of churches I saw while travelling around: Baptist. Catholic. Nazarene. Church of Christ. Pentecostal. Unitarian. Methodist. Congregational. Jehovah’s Witnesses. Non-denominational. And that is just a small sampling from where I grew up in Maine! If you went down into the rest of the United States, you found others, such as Lutheran, Presbyterian, Eastern Orthodox, Anglican, Episcopal, Dutch Reformed, Mormon, Seventh-Day Adventist, and many others that I had never heard of, even within grade-school banter. With all these different denominations and sub-denominations, as well as local and personal expressions of belief and differing teachings within churches, it becomes a bewildering task at best to try to keep up with all of the different doctrines, beliefs, and practices of these various groups. Even within our fundamental independent Baptist Church, we the members had considerable differences in opinion, especially about some of the non-essential doctrines. Before, during, and after I attended Christian college, I noticed that Christian people of various backgrounds treated these doctrinal differences in several different ways when they interacted with each other, but there were two basic sets of contrasts: the contrast of tolerance versus intolerance, and the contrast of silence versus confrontation. Most people chose one from each category, so that they would have a combination, such as silence and tolerance, or confrontation and intolerance. Sometimes the extremes of each category were not chosen, but some point on a sliding scale in between the extremes. So somebody might be “fairly tolerant” and “moderately confrontational.” These were just the real-world experiences of Christian people interacting with each other in society. But what does God’s Word say about this? If brethren disagree about a biblical issue, should they remain silent and tolerant about it, or should they be intolerant and confrontational about it? Or some other combination? And to what degree? I think we have to determine several factors, including the severity of the issue, and whether their belief in the particular doctrine, and their influencing others to believe it, is causing harm or not. I believe there are some fundamental doctrinal differences that can make a very big difference in whether a person is truly saved from their sins or not. These issues should at least be acknowledged if they come up, and we ought to let others know where we stand. Regardless, however we choose to handle the situation, we need to do it in love, and not frustration or malice. When Moses grew angry with the people, he disobeyed God and struck the rock when he should have spoken to it. As a result, he was not allowed to enter the Promised Land—a huge disappointment to him. Now lest anybody get ahead of me, showing the love of God in one’s life does not equal sound doctrine. But it does give evidence of having gotten at least two important commandments right—loving God with all one’s heart, soul, and mind, and one’s neighbor as one’s self. If you were thinking about either changing or confirming the doctrines you hold, who would you want to teach you—someone whom you knew was disobeying some of God’s most important commandments, or someone who was consistently living them out? I think we all know the answer to this. When Hebrews 10:24 says “And let us consider one another to provoke unto love and to good works,” it’s pretty hard to provoke someone unto love and good works if you are not being loving yourself. So if you want to influence someone else to come around to your way of thinking, you need to first show that you have their best interests in mind. Yelling at someone that their doctrine is wrong is not the way to do it. Sitting down with them and calmly explaining why you believe what you believe is much more likely to yield fruit. So when preachers, teachers, Bible scholars, and prophecy moguls feel the need to disagree with the astronomical alignment of the Revelation 12 Sign in the heavens, why do they act like sly serpents or roaring lions or bitter badgers, throwing caustic acid on their enemies all over YouTube? This isn’t the way to make friends and influence people. Certainly not God’s way. Hebrews 10:25 goes on to say, “Not forsaking the assembling of ourselves together, as the manner of some is; but exhorting one another:” Regular attendance at a godly church is important. Be as consistent as you can be—why? Because we need to exhort one another. Exhort means to build up and encourage people. In these very difficult times, those of us who know the Lord need to lovingly encourage our fellow disciples—not tear them down. Finally, Hebrews 10:25 ends with this: “as ye see the day approaching.” This little snippet is a reminder that we will indeed see the day approaching. That means God has given us ways of knowing when we are on the final standby for our flight to Heaven. 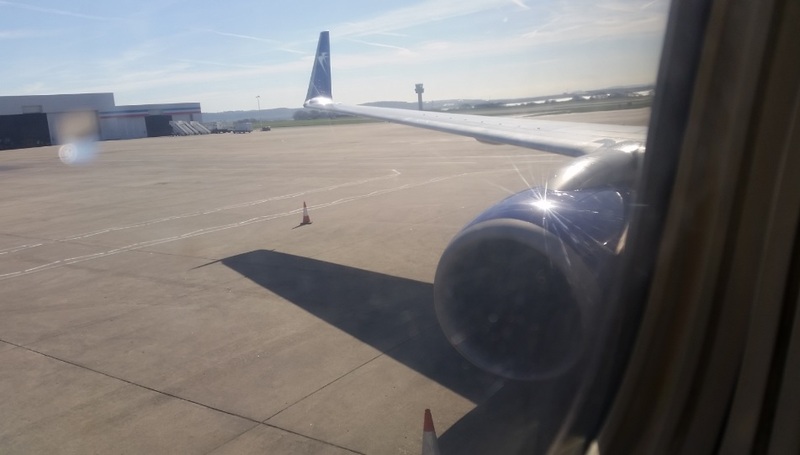 We have entered the airport, we have checked our bags, we have gotten our boarding passes, we have gone to our departure gate, we have boarded the plane, we have taxied to the runway, and we are just waiting for clearance from the tower for takeoff. Barring something majorly unforeseen (which, I suppose could happen), we’ll be taking off very soon. We don’t know exactly when, but we see the day approaching. Therefore, for a fellow passenger on the plane to start screaming about how we can’t possibly know if we’ve even driven to the airport yet, is kind of silly. Some say we’re at the airport—or we may be—but we can’t know if we’re on the plane yet. Way too many of our Christian ministers and scholars belittle those of us who look around us and compare our surroundings with our flight itineraries. We recognize the parable of the fig tree, the signs in the heavens, and the signs on the earth. Yet they are making plans for their retirement in a condo in Florida 30 years from now and the idea of being whisked off to be with the Lord in Heaven in the next month or so doesn’t match their own personal flight plan. They’re not even sure we’re at the airport, let alone on the plane and waiting for takeoff. Can they not feel and hear the jet engines whining a few feet outside the passenger cabin? Can they not see the flight attendants demonstrating how to use the oxygen masks? They still think we'll be waiting to takeoff for a hundred years. Since they fail to realize we're about to takeoff, I just hope they recognize the destination when we get there. well, one has to wonder who is actually at the airport and who is NOT. Hopefully, those children sleeping through it all will simply wake up in the car realizing that Daddy packed them in for the trip in their sleep. Maranatha! "as ye see the day approaching" Heb 10:26 is the same day in 2 Thess 2:3 "Let no man deceive you by any means: for that day shall not come, except there be a falling away first, and that man of sin be revealed, the son of perdition; Who opposite and exalted himself above all that is called God, or that is worshipped: so that he as God sitteth in the temple of God, shewing himself that he is God" The "Man of Sin" is Lucifer in flesh aka Antichrist sitting on the Throne of Pergamon aka Satan's Seat in the 3rd Temple Rev 2:13. Perdition means "Utter destruction, lost, destroyed, calamity, spiritual ruin"
Don't be fooled folks, we are not approaching "that day"
The people spoken too by Paul were afraid they missed the rapture, so they were thinking that now they lived in the time of the day of wrath. Paul assured them that was not the case! The "man of sin " does not need the 3rd temple to reveal himself. The abomination will stand in the holy place where it ought not to. On the ninth of av when the Jews were mourning in the western wall, for the first time the Palestinians protested that the Jews were taking away their wall. Once the abomination is revealed the rapture will happen. Great and thought provoking post Gary. Thank you. Gary.....ive been a watchman for 25 years and i have seen many discussions about the Biblical endtimes. But i never hear anyone speak of Jerimiah 30 which i believe is a major key in knowing if the the world is in the last generation. It speaks of a man giving birth. I believe this is saying that the last generation will be a unique time period. I mean like completely different than all the generations that came before it. Since adams time the world has been pretty much the same but the past 100yrs this world has drastically changed. Combine this fact with other things that are said to only be a characteristics of the last generation...seems to me that there is no way that all this coming together is chance. Anyways i was just wanting to know if you have looked into that chapter of jerimiah. There is absolutely no doubt in my mind whatsoever that not only are we in the last generation but at the tail end of it! I expect the rapture to happen at anytime and it is a very strange and exciting feeling a d to be honest kinda scary but in a good way, if that makes sense lol. Peace and God bless! Thank you, Jim. Graciously worded. Oh, and last time I checked our flight status...our departure is right on schedule—no layover, no delay! No fool here. I've got my eyes wide open and my boarding pass that says JESUS! I'm all ready to go! Exactly the way I feel. In fact I woke up a few days ago and felt the Lord say, "Make sure you have sent your luggage on ahead". Sure, you can't take your material possessions with you, but you can store up your treasure in heaven, you can go out to the highways and byways to compel people to find a seat at the Father's great banquet table. But it sure feels unusual doesn't it? The rapture is NEVER going to feel natural, it is God's dimension, his reality breaking into ours. And just as surely as Jesus came the first time, he is coming the second time. And of all the times in history this seems most likely. So buckle up, seats and trays in the upright position. Hi Gary reading several of your posts on here I can see that you are called to this. Having recently been in a situation of varying opinions myself with a fellow believer I too would like to offer an extra leaf of encouragement. Each one of us has a unique calling and purpose in the body of Christ. Although Paul teaches in 1 Corinthians 12:12-27 that all parts need each other and if one part suffers all parts suffer, there are those that think that as long as they don’t agree/understand what others have been called to do then it must be wrong, disregarded and fought. This is a sad state. My advice to everyone is strap in very very tight as we wait for take-off. I heard in my Spirit yesterday that many things we do not understand are going to happen, but the Lord will watch over us. Like taking off against very powerful and resistant winds. For the unbeliever and naysayer out there I leave you with Hebrews 3:7-19. Do not harden your heart so you can enter the Lord’s rest. Do not join the long ancient line of many many Jannes and Jambres (2 Timothy 3:8). Remember if the rapture does not happen on September 23rd it is a Bible written truth and is STILL going to happen. Rend your heart! I dreamt yesterday I was talking to a friend and a voice told me to read Revelation 12 and Revelation 19 and find similarities. The similarities I saw in both chapters was ultimate happiness 1st being raptured and 2nd being at the marriage supper. Any ideas from fellow readers? i have a round class ticket, with a 7 year 'stop over' in the best transit lounge money can buy!! This sign I saw in the sky may have been the invitation sent ahead of the event.I don't usually go into my whole experience of what Abba Father is doing with me, but I'm just letting it flow now. Three years ago I was given a dream/vision. I don't dream much, and cant remember any of them I ever had, but this one is still like it happen last night. Of course I had been praying for two years for one so as to be a better witness on the wall. This came on me when my wife had gone to spend the night out of town with our son. I was driving my truck at night in a rural area at night, I know because there were just a few lights from houses in the distance, and my own vehicle lights. When I came up to what I believe to be a four way stop, because a car stopped on the street at my left at the very same time. As I was waiting to see who might go first, all of the sudden everything went black, no lights at all. I couldn't see my hand in front of my face, even the cars wouldn't run or there lights, I could feel the evil in the darkness...EMP?...Then a light like a full moon came up in my upper left windshield. The only thing wrong, was there wasn't any moon with it just the light way out in the atmosphere. When all of the sudden this light started moving slowly down toward earth. This light stopped at about what I think would be cloud height being it so dark it was hard to tell. As I was staring into the light, I could see an object through it way back where the light had started from. Then the object started moving slowly down until it got into the middle of the light. Then I could tell what it was, a huge florescent Cross, and that's where the dream ended. As soon as I awoke I took it to prayer, what was the message here? The Holy Spirit stopped me as soon as I started, and just said, you already know what this dream means. It told me that the evil darkness I felt was the beast rising, and that was why He had me studying prophecy when the Holy Spirit had me start with Revelation when I first read the bible, then sent me to the book of Daniel before I started Genesis, but as long as I believe in what the cross represents I will be OK.....THAT CROSS IN THE AIR IS WHAT WE ARE WAITING FOR!!! I grew up as a Mid-Trib, or Post-Trib, or Unknown-Trib, etc. believer. I didn't really understand the end-times, but I was pretty sure Pre-Trib didn't fit what I saw. I thought this mostly because that's what I was TOLD by people I thought knew God. Last year, God showed me that I was not actually FOLLOWING Jesus, I was merely saying I did and continuing on with my life, just like the world. One of the very very first things he showed me during that time was as I was reading through Revelation, I started noticing how many times it says things like, "this takes wisdom", or "let the one with wisdom calculate the number of the beast", or "those with ears to hear". I remember very clearly thinking, "Whoah. I'm supposed to understand this book." That started a journey over the last year (about a year exactly now) of searching through the Scriptures and history to try to understand the signs of the end. I grew more and more convinced as I searched that we were living in the final days, and the Tribulation grew nearer and nearer. But I still didn't believe the idea of Pre-Trib rapture, mostly because I never saw arguments presented, and the people I ran into who believed in it were rather obnoxious about it. Then I came across this site a few weeks ago. The first thing that struck me, and I shared this with my wife, was that Gary, Jeff and team are so humble. I told her, "It's really cool - he shares what he believes, but then he says, 'Hey! I could be wrong! All I know is there is a sign happening, and this is what I THINK it means, but I'm open to the fact that I could be wrong!'" The people on this site live out exactly what this article is talking about. It's the humility here that first got my attention - the humility and the love for God and his people. After seeing that, I began reading the well-crafted reasons why they believe in the Pre-Trib rapture, and I began to be swayed. It wasn't thrown in my face like I've seen others do ("How could someone be so stupid to miss this?!?"). It was reasoned out, with lots of Scriptural support, and communicated with love. Now, after just a week or two of clicking through and reading article after article, I've become much more confident in the idea of a Pre-Trib rapture, and I'm eagerly anticipating Jesus' return rather than fearing a tribulation of seven years. I was able to share this idea with my little sister who told me last year that she doesn't want it to be the end times because she's scared of the tribulation, and I'm hoping it helped bring her some peace too. Thanks for all you guys do! I'm looking forward to hanging out with all of you very soon when we get home! Thank you so much for sharing this, Josh. It confirms to me something that I have shared with Gary, Greg, and others not too long ago. I realized how volatile the online community can be when it comes to eschatology (end-times), and I knew that Gary and Greg had laid a solid foundation with this site. It's the character (Christ-likeness) and maturity, patience and humility, that becomes attractive to others who have been bruised and beaten elsewhere. I'm thankful to be a part of Unsealed. Thank you again. I am refreshed and encouraged! Well said. Hebrews 10 has become pivotal to me in this time of my life and for several reasons. It gives us our marching orders and so clearly reminds us of what we should be thinking about and doing. 10.22 LET US APPROACH [GOD] WITH A TRUE HEART WITH FULL CONFIDENCE OF FAITH HAVING BEEN SPRINKLED THE HEARTS FROM A CONSCIENCE OF EVIL AND HAVING BEEN WASHED THE BODY WITH PURE~WATER. In (Exodus 24:8), Moses sprinkled ("dashed" in Hebrew) blood on the people saying, "This is the blood of the covenant that the LORD now makes with you concerning all these commands." Sprinkling is peculiar in scripture and worthy of your personal exploration concerning inward cleansing. I find myself wondering if the LORD will call us Home on a Sabbath. He commanded Israel to keep the Sabbath holy did He not? If so, Shabbat Shuba ["Shuba" a feminine noun meaning "withdrawal"] ("Sabbath of Her Return" or "Sabbath Return") which begins sundown of 9/22 is a candidate Sabbath I ponder. Lol. "Proof readers untie!" I caught that one, Rich.